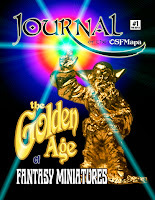 Well, I am furiously attempting to paint a bunch of 70s lead miniatures for the end of May - this being the deadline for the OSFMapa journal. Almost finished my article but need the pics....if I don't finish them then it's down to unpainted ones - not a problem either way but it would be nice to have finished them at last...they've been waiting 35 or more years. I am still annoyed that the film bombed at the box office. Rich Ross, the head of the Disney film making studio has resigned..... personally I feel he must have had an enemy in the ranks so JC was bombed from the planning stages. You don't f**k with Hollywood boys. "The film, which was based on a series of books by Tarzan writer Edgar Rice Burroughs, eventually cost more than $250m (£155m, 189m euros) and last month Disney said it expected the film to lose about $200m"
Just got an email and this is from Stan Johansen, sculpted in the early 70s.